I dangled out the bus window and sniffed the air. It was damp, earthy, and green. Inside the bus were nine other Kilimanjaro trekkers (also somewhat damp, earthy, and green! ), four guides, a handful of porters, and many rucksacks. 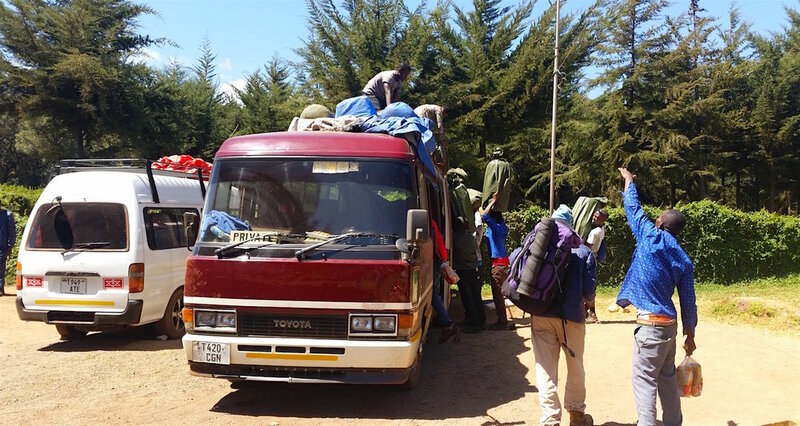 Outside the bus, the congestion of the Moshi-Arusha highway gave way to savannah, to plantation-farms, and, as the bus steadily gained elevation, to montane forest of pine and cypress. It took more than three hours for the transformation from urban to (nearly-) wild to be complete, but the views were already worth it. Modified image from Google Earth Pro. Villages were few on this more remote side of the mountain. Groups of shamba* farmers and wood-gatherers appeared, seemingly by means of the ubiquitous African motorcycle. Some of these farmers worked tiny plots of vegetables growing in the berms beside the road. I could almost reach out and pluck carrots and cabbage leaves as we lumbered past. More impressive were the potato fields. These were chunked out of the forest and open to the sky. Teams of men, women, and children clustered in sun and shade, digging, sorting, and hauling out the spuds. Lumpy white sacks of potatoes stood erect by the road, each as tall as a man. They awaited some transport of a different order. The same was true of the wood piles that gatherers had collected. It became obvious that the lower slopes of the Kilimanjaro massif were a veritable garden. Those who worked them took little note of us. They rested on their haunches, laid on their backs, or remained bent on task even as we climbed toward ours. Busses of noisy foreigners must be an everyday sight here, I thought. The Shira Ridge, the remnant of Kilimanjaro's most ancient volcanic crater, dominate the horizon. Our destination was at its base. It had taken almost a year of planning, but the day had come. Today we put boots on Kilimanjaro. The thought was exhilarating. The start, however, was a false one. We pulled through a spindly ranch gate. Yellow letters on a brown sign identified the stop: "Kilimanjaro National Park, Londorossi Gate Entrance." Inside, the place was abuzz with busses, safari vehicles, and crews like our own. Robert sprang to life. "We'll get out here and stretch for a while," he announced vaguely. "Box lunches for everybody." I grabbed my backpack and slipped off the bus. I stood inside a wire mesh fence amid a collection of buildings, shelters, a radio tower, and plastic water reservoirs. It was something between a ranger station and a picnic grounds. Groups of climbers with hats and poles lounged about. Some stood in line to use what could prove to be the last real loo. Guides with papers in hand pressed an official-looking window on a central building. Outside the fence, vendors dangled trinkets and attempted to get the attention of the foreigners. Others simply begged. The shelter came complete with pool table. It was fairly level. Our group migrated toward seats inside one of the shelters (complete with pool table). Nondescript boxes appeared out of nowhere with lovely lunches inside. We dined on fried chicken. Word spread: there was no hurry. Pole. Pole. Londorossi Gate rests on the northwest side of Kilimanjaro National Park, approximately 25 miles from Tanzania's border with Kenya. As I learned, it is the registration point for all climbers approaching the mountain via the Lemosho or Shira Routes. No one enters the area without permission from the Tanzania National Park (TANAPA) authority. And no TANAPA permission comes quickly. I found myself wondering how trekker traffic must congest at the busier entrance points to the park. An hour went by without movement. I threw my lunchbox away and wandered about the station, reading the posted signage. I discovered that Uhuru Peak, Kili's highest point was 30 miles from this point. Of course, that was the easier measure, the horizontal one. The vertical measure of our goal was a mere two miles. Straight up. Another sign alerted "esteemed visitors" to the ten commandments of the mountain. Eight of these were expected, two were not. A footnote completed the covenant. Number Nine was comforting: "If symptoms of mountain/high altitude sickness persist please descend immediately and seek medical treatment. Our rescue team is always stand-by for evacuation to nearby hospital." I assumed this was the purpose behind the radio tower. Number Four was startling: "Refuse and expose corruptive practices, advances or gestures." For some reason I thought of my good friend Dan Dyke. Finally, a footnote in italics offered a reminder of this modern age: "Please like our facebook page 'Kilimanjaro National Park' and share with friends your memorable Kili-Photos!" An exclamation point sealed the deal. How did Burton and Speke manage their travel in East Africa without Facebook? Robert was responsible for not only guiding us to the top of the mountain, but for managing the Kandoo Adventures staff. It shames me to say it (just a little), but our team of ten climbers was supported by a crew of 30 persons. This crew included guides, a cook, and porters. I wandered over to the other side of the administrative building. Robert was still organizing. A much larger collection of porters had materialized and were assembled in a large circle. As I would soon discover, these men would carry our camp up the mountain on their heads, provide for our comfort with their hands, and become our friends with their words. Our duffel bags were distributed among them and sealed in rubber sleeves. As it turned out, Londorossi Gate was simply an administrative stop. It was a paper gate. Once our full team was assembled and all TANAPA registration completed, we boarded the bus again. This was not the starting line for our trek; that was a spot back down the road. Our boots would certainly touch Kili today, but for the moment it was only a light tap. After the organized shuffle, all bags were reloaded on the top of the bus. *The shamba system refers to a controversial form of landuse that allows local communities to farm and gather from clear-cut areas of public forest. In theory, those who cultivate crops over the short run are also responsible for replanting tree seedlings. The hope is that landless communities will participate in the reforestation/conservation effort. This initiative has obviously not been fully realized. Shamba is Swahili for "garden" or "farm."